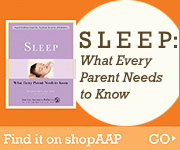 ​What are the 2 most important things to remember about safe sleep practices? Remember…Back to Sleep, Tummy to Play! Doesn't sleeping on her back cause the baby to have a flat head? Parents and caregivers often worry about the baby developing a flat spot on the back of the head because of sleeping on the back. Though it is possible for a baby to develop a flat spot on the head, it usually rounds out as they grow older and sit up. Alternate which end of the crib you place the baby's feet. This will cause her to naturally turn toward light or objects in different positions, which will lessen the pressure on one particular spot on her head. When the baby is awake, vary her position. Limit time spent in freestanding swings, bouncy chairs, and car seats. These items all put added pressure on the back of the baby's head. Place yourself or a toy just out of the baby's reach during playtime to get him to reach for you or the toy. While keeping watch, have a young child play with the baby while on his tummy. Young children can get down on the floor easily. They generally have energy for playing with babies, may really enjoy their role as the "big kid," and are likely to have fun themselves. Place babies on a firm sleep surface that meets current safety standards. For more information about crib safety standards, visit the Consumer Product Safety Commission Web site. Keep soft objects, loose bedding, or any objects that could increase the risk of entrapment, suffocation, or strangulation from the baby's sleep area. Make sure the baby's head and face remain uncovered during sleep. If you are working in a family child care home or center, create a written safe sleep policy to ensure that staff and families understand and practice back to sleep and sudden infant death syndrome (SIDS) and suffocation risk reduction practices in child care. If you are a parent with a child in out-of-home child care, advocate for the creation of a safe sleep policy.